Who wants to join me in bringing back the feel of summer! It's been very cold here in Idaho the past week or so. It actually hit 3 degrees this week, and I just celebrated my birthday with a snow day. The joy of having a December birthday, but it was actually pretty relaxing and I enjoyed it. With Christmas in a few days, sangria's can be a perfect smooth and fruity drink to bring a sense of warmth to your holiday gatherings. Sangria comes from the Spanish word "Sangre" which means blood. This comes to no surprise seeing that typically Sangria's are a very dark crimson color. They were introduced to the U.S. in 1964 during the world fair. The key to making a great sangria that is in season is the fruit. Fill your sangria with fruit that is in season, and it will be a hit every time! For Christmas season, stick with the "erry" fruits(cherries, blueberries, cranberries, etc. ), grapes, peaches, and other wintry fruits. Teresa: "I like to think of sangria as a wine cocktail. 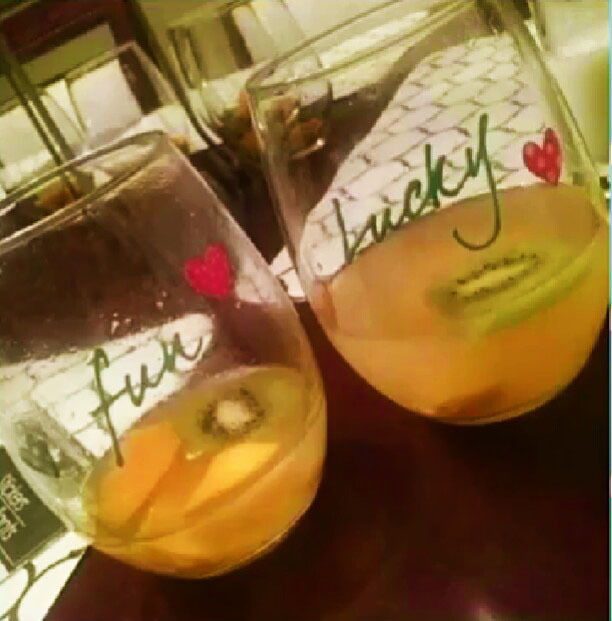 Anyone can make any type of sangria to fit their palette if they just follow a very simple guide line." 1. Choose a flavor. Do you want citrus, berry, spice, or tropical flavor? 2. Choose a wine. Red or white? I like to use white with my citrus, spice, and tropical flavored sangria, and red with my berry flavor. Once again it's about your taste. 3. Choose a liquor. I have always used a rum or a vodka just because I don't like brown liquor. 4. Choose a juice. Pineapple, apple, orange, grape are all juices you can incorporate in your sangria. 5. Use fresh fruit. Depending on the type of sangria you choose to make. Add fresh fruit to compliment the flavor. 6. Add a simple syrup. By adding a simple syrup it an additional sweetness to your sangria. 7. Make a day in advance to allow flavors to marinate. 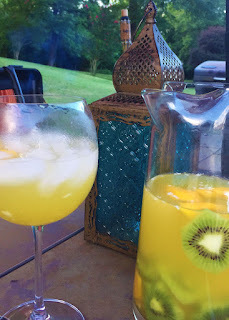 A sangria at our last get together at Teresa's house in August when I visited NC. What are some of our favorite Sangria recipes? Leave us a comment below!